While I was incredibly excited for Marvel’s previous film Black Panther, my expectations were relatively low for Avengers: Infinity War. Maybe it was from my disappointment from Age of Ultron or the over-saturation of Marvel movies. Maybe it was from the unremarkable marketing of the film. Personally, I thought the trailers looked pretty generic. So, I decided to see the matinee with the relatively low Rotten Tomatoes score and Metacritic score in mind and it was everything I could have asked for in a Marvel movie. The cast was massive, yet none of their stories conflicted with one another. In fact, they were interwoven quite well as they all had one focus, to secure the Infinity Stones before Thanos and his goons get a hold of them. I won’t spoil a thing, but knowing this is the first part of a huge climax in the Marvel Cinematic Universe, you can expect the Avengers to become seriously damaged at the end. Yes, people will die, but that’s not much of a spoiler having knowledge of the villain Thanos in mind. He’s ruthless and will do whatever it takes to achieve his goal. As he approaches closer to his goal, the more powerful he becomes. At this point, the Avengers are well-experienced for a battle of this scale and you do see some epic moves from every superhero. Given that this is a Marvel movie, the humor excels in Infinity War. Many of you have at least seen memes from lines spoken from certain characters of the film. Drax, in particular, stands out as delivering the funniest lines in the movie. Plenty other characters produce quality jokes throughout the film and none of them seem out of place or during awkward situations, a rarity in MCU films. While the humor rivaled that of the first Guardians of the Galaxy, the action goes above and beyond. The cast all travel to various locations in the universe and each action sequence feels like a Dragon Ball scene. Characters fly all over the place, explosions erupt left and right, and brutal punches and kicks occur frequently. It’s a sight to behold sometimes. Stories have been hit or miss with Marvel movies. Thankfully, the story was a home run in Infinity War. I did not expect such a high level of depth and lore, so I was pleasantly surprised. Thanos shockingly becomes a protagonist and the focus of the story. He’s less of a destructive maniac like most villains and more of someone with misguided motivations. His past is explored in the movie and Josh Brolin delivers a great performance as the purple man with the glove. As the film dives into the history of basically each new location, they all came to life and had meaning rather than just being a pretty green screen effect. 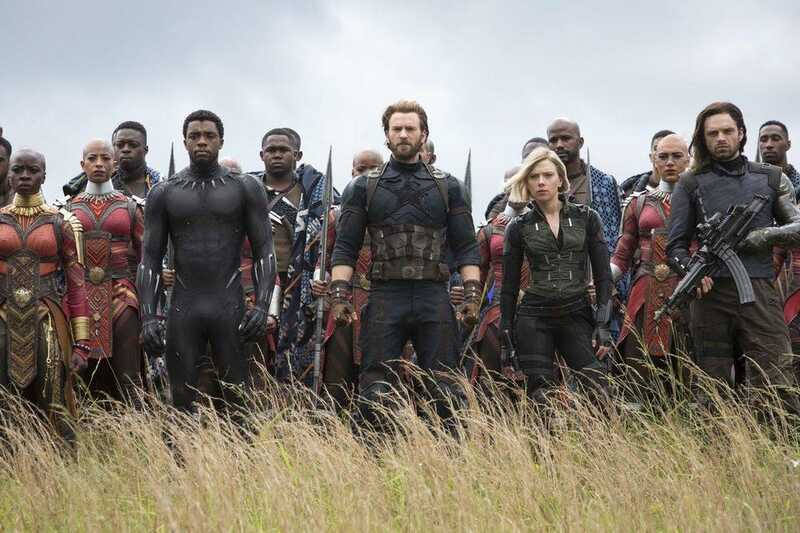 While Infinity War is the longest Marvel movie yet, clocking in at approximately two hours and forty minutes, it felt like a two hour movie rather than a three hour one. It slowed down a tad bit when the characters explained where they were going and why, but even those explanations felt purposeful. Also, a lot of the film takes place in space and I like space, so that’s another bonus for me. The score added spice to the action and is probably one of Alan Silvestri’s best works yet. It kept a somber tone as it should since the film gives a strong sense of hopelessness in the conclusion. The cinematography did its job. Every scene was shot appropriately, though I would have preferred if it showed how large the settings were in comparison to the characters. Overall, Infinity War is a must-see. It exceeded my expectations and the scores most critics gave it. Everything was of the highest quality. The characters, the villains, the action, the humor, and the story. It’s impressive to see Marvel continuously provide excellent films and maintain continuity for a decade. Some films didn’t blow audiences away for sure, but when their movies are good, they’re excellent. I’ll happily watch this multiple times, especially with the complexity of the narrative. This is a 10/10 for me. It’s easily the best Avengers film so far and I’m eager to see how they conclude this epic adventure. Excellent characters, dramatic story, hilarious jokes, and unbelievable action sequences. This is a Marvel movie at its finest.